The little diapered dude in your life may not be capable of walking (he's still mastering the art of crawling) but he's always game for a round of carpet wrestling with dad. When dad isn't teaching him the fundamentals of the sport, the names of all his favorite wrestlers, and the difference between an Iron Man match and a Battle Royal, then he's cuddled underneath the big guy's arm watching Monday Night Raw or Friday Night Smackdown. ('Precious' is not a typical word to describe wrestling but this particular activity can certainly be described as 'precious,' or 'darling,' or just 'so stinkin' cute.') 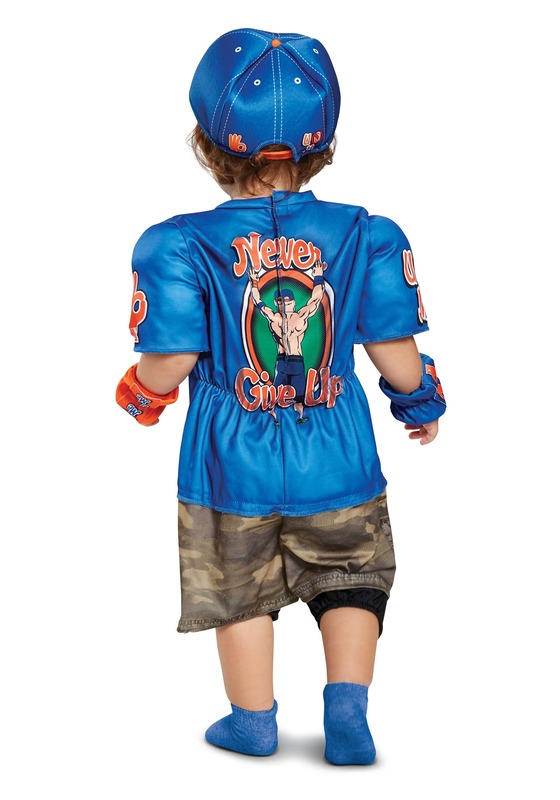 His father is doing a fine job of motivating him to become the next biggest wrestler since John Cena which is why this officially licensed WWE costume is so perfect. It transforms babies into John Cena superfans until their trained and educated in the art of wrestling, or at least until their motor skills fully develop! 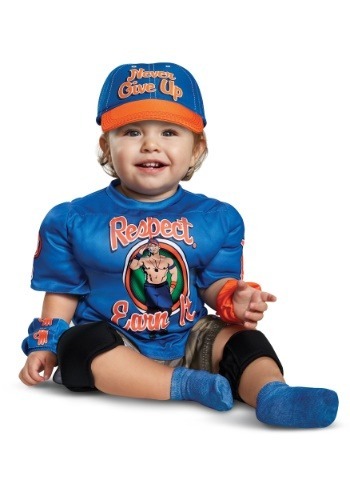 The t-shirt portion of the jumpsuit features soft-sculpted muscles for a 'tough-guy' look as well as a printed image of John Cena and his popular phrase, "Respect, Earn It," (which is quite funny once you really think about it since babies don't have a clue about 'respect.') The camo-printed shorts portion has an elastic back waistband. The baseball-style cap promotes Cena's other popular phrase, "Never Give Up," while the wrist bands and knee pads round out this adorable look. Want to see a match so cute it will make you squeal with delight? Dress baby in this John Cena costume while daddy wears the matching adult-sized version. It will create a pay-per-view worthy match the whole family will want to witness so invite them over to ogle at the adorable spectacle!